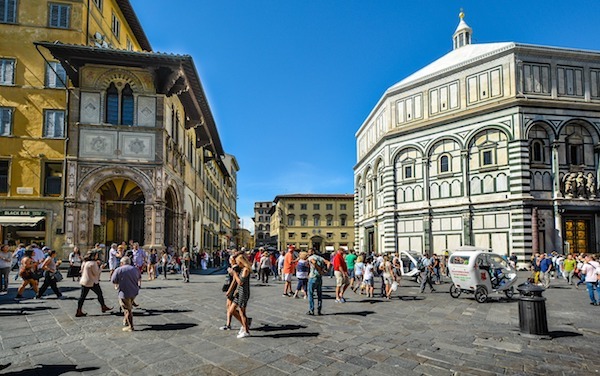 While just about any run in Florence can be described as a ‘sightseeing’ tour, our ‘runseeing tour of Florence features the historic center and the city’s main sights. We strongly recommend doing this run early — after 8am you might fighting with crowds to just walk. We try to make as few turns as possible, but labyrinthine streets make that a challenge…Use this guide as an outline and improvise your own route. Shorter Option. Save 3.5 km by eliminating the Piazzale Michelangelo. At the San Niccolo gate, get onto Via di Belvedere and join the route from there. Do it Yourself Option. If you get up early and would prefer to create your own route in the center, here are some key streets/sights to run (from Wikipedia): Via Camillo Cavour, one of the main roads of the northern area of the historic centre; the Via Ghibellina, one of central Florence’s longest streets; the Via dei Calzaiuoli, one of the most central streets of the historic centre which links Piazza del Duomo to Piazza della Signoria, winding parallel to via Roma and Piazza della Repubblica; the Via de’ Tornabuoni, a luxurious street in the city centre that goes from Antinori square to ponte Santa Trinita, across Piazza Santa Trinita, characterised by the presence of fashion boutiques; Via Roma, Via degli Speziali, Via de’ Cerretani, and the Viale dei Colli.